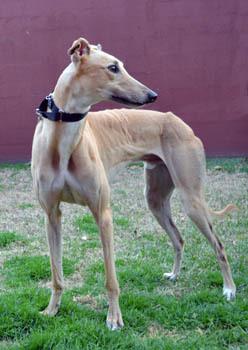 Fanta, aka Killer Fancy, is a 3-year-old red fawn male born November 9, 2009. His sire is Lonesome Cry and his dam is Slatex Sunflower. 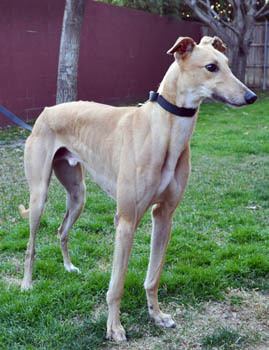 Fanta has 69 races to his credit on Greyhound-data.com. He started his career on July 15, 2011 at Bluffs Run, and ended it on December 21, 2012 at Gulf Greyhound Park, winning three of those races in the process. Fanta is looking forward to finding a forever home! Fanta passed an initial cat test, however, after spending some time with cats in a foster home, his desire to chase the cats proved to be too great. Fanta cannot be trusted around kitties. Fanta is a young energetic, playful dog with beautiful dark-rimmed eyes. He likes to keep an eye on the goings-on of the house. He also likes to carry big toys around the house and he will move them upstairs and downstairs as he sees fit. He loves to have his toys gathered around him on the bed. He sleeps through the night on a dog bed near our bed, and likes to sniff along the kitchen counters but is easily corrected and has never tried to grab anything off the counter. Fanta gets very excited about going new places and rides well in the car. He loves walk time!